Argentina has defaulted.Argentine Finance Minister Axel Kicillof delivered the news to the world from Argentina’s consulate in New York City on Wednesday. Kicillof had just finished a meeting in which he and a delegation from The Republic failed to satisfy the demands of a group of hedge fund creditors negotiating over $1.3 billion worth of debt owed to them for over a decade. Without the stay and without payment, Argentina is in default. “Notwithstanding any claim to the contrary, Default is not a mere “technical” condition, but rather a real and painful event that will hurt real people: these include all ordinary Argentine citizens, the exchange bondholders (who will not receive their interest ) and the holdouts ( who will not receive payment of the judgments they obtained in Court),” said Daniel Pollack the Court’s appointed mediator. Pollack also said he would continue to make himself available for more discussions. In Argentina’s defense, Kicillof repeated the same argument that the administration has been making for months — that paying the “vultures” would be a violation of Argentine law. That’s because there is a clause in The Republic’s bond agreements called the RUFO — Rights Upon Future Offering — clause. It expires in 2015. According to RUFO, if Argentina negotiates better terms with some bondholders, all bondholders have a claim on those terms. That would open the country to up to $15 billion worth of payments. Earlier this month, the Court didn’t buy that, and refused Argentina’s request for a stay on payment until negotiations could be worked out (ideally with a payment to NML due in 2015). 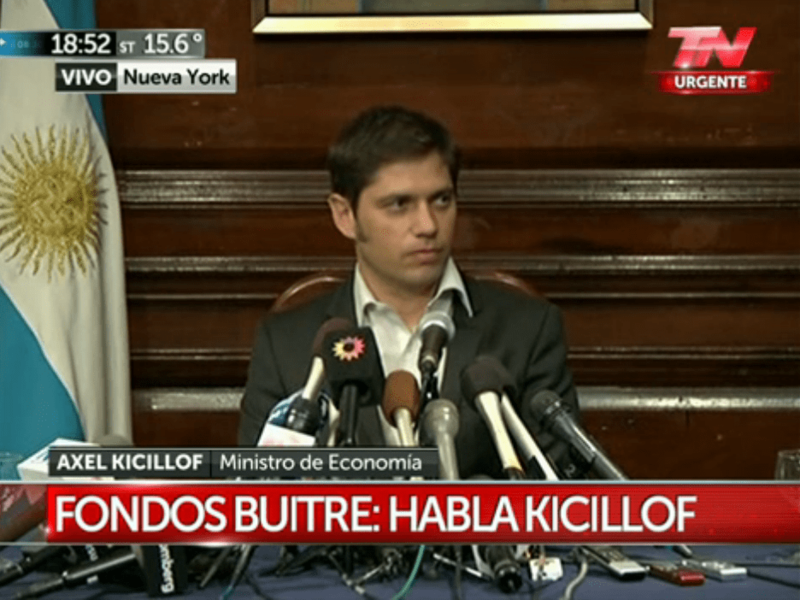 “This was a situation of extortion,” said Kicillof. “We will not just sign anything that could lead to more external debt for Argentina… We will avoid it with all of our weapons.”The “vulture funds” are investors known collectively as NML Capital and led by hedge fund billionaire Paul Singer. They would not take haircuts on debt dating back to Argentina’s last default in 2001 like over 90% of their fellow bond holders. To Argentina that refusal made them vultures, and you don’t pay vultures. Instead you sue them all the way up to the Supreme Court and lose. What’s off about all this is that the $15 billion from RUFO is chump change compared to what the country might have to pay if it goes into default. Default opens the country up to “acceleration clause” claims — in which bondholders sue for all their money at once, and immediately — worth $29 billion. That’s everything in Argentina’s Central Bank. Earlier today, Argentine bankers put together a last ditch rescue package. They offered to put down $250 million as collateral — a show of good faith that the country was willing to pay (and avoid triggering RUFO) in 2015. Another option would have been for banks to buy NML’s debt, and then request a stay on payment themselves. But for any of that to happen there would have had to be a stay on payment, and hedge funds would not allow that to happen. Indeed, even before Kicillof said a word Standard & Poors cut the country’s rating to “selective default” — meaning Argentina chose to renege on some of its payments, but not all of them. In his address, Kicillof said that he would not be surprised if NML held sway over rating agencies, and would try to use its power to make things very uncomfortable Argentina. When Argentina tried to pay exchange bondholders earlier this month, Griesa sent that money right back to The Republic. And there it sits in a Bank of New York Mellon custodial account. The full statment from Pollack is below. This morning and this afternoon, representatives of the Republic of Argentina, led by Minister of the Economy, Axel Kicillof, and representatives of its large bondholders held further face-to-face meetings in my office and in my presence. Unfortunately, no agreement was reached and the Republic of Argentina will imminently be in Default. Today, July 30, was the last day of the grace period for the Republic of Argentina to pay many hundreds of millions of dollars of interest to its “exchange” bondholders, i.e. those who took bonds in 2005 and 2010 in exchange for the bonds they held following the Default of 2001. In order to make that payment of interest, however, the Republic of Argentina was also required, simultaneously, to make a “ratable” payment to the bondholders who declined to accept the exchanges of 2005 and 2010, i.e. the “holdouts”. 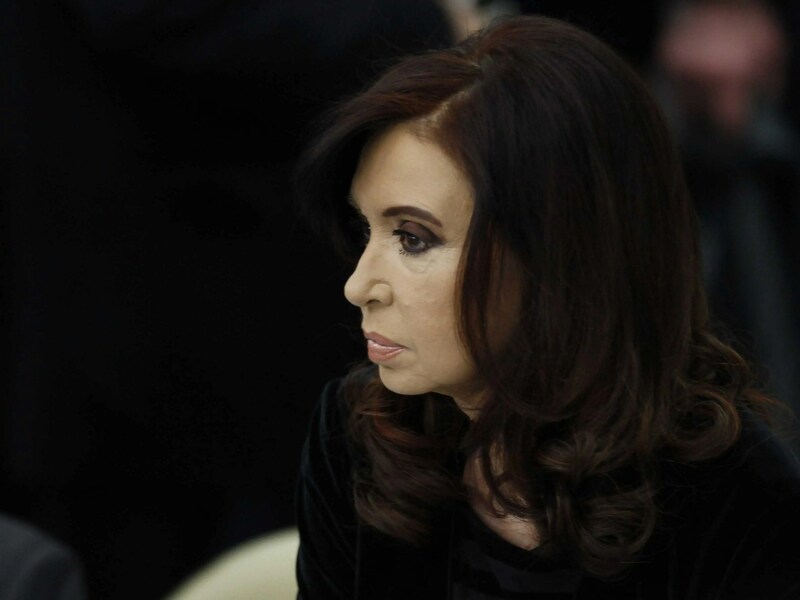 The Republic of Argentina did not meet those conditions and, as a result, will be in Default. Notwithstanding any claim to the contrary, Default is not a mere “technical” condition, but rather a real and painful event that will hurt real people: these include all ordinary Argentine citizens, the exchange bondholders (who will not receive their interest ) and the holdouts ( who will not receive payment of the judgments they obtained in Court). The full consequences of Default are not predictable, but they certainly are not positive. This case has been highly publicized and highly politicized for many weeks. What has been perfectly clear to me all along, however, in my capacity as the neutral Special Master, is that the laws of the United States must be obeyed by all parties. The courts of the United States (both the United States District Court and the United States Court of Appeals), after full briefings and hearings, ruled that the Republic of Argentina could not lawfully make the interest payments to the exchange bondholders unless it simultaneously made the payments due the holdouts. I have worked relentlessly, over a five-week period, to bring the Republic of Argentina and its bondholders together in an agreement that would allow the June 30 interest payment of many hundreds of millions of dollars to be made, and to be made lawfully, thereby avoiding Default. It is not my role or intent to find fault with either side. I will continue to be available to the parties to aid them in reaching a resolution which they must reach in the interests of all concerned. Default cannot be allowed to lapse into a permanent condition or the Republic of Argentina and the bondholders, both exchange and holdouts, will suffer increasingly grievous harm, and the ordinary Argentine citizen will be the real and ultimate victim.